A pilonidal sinus is a small hole leading to a tunnel or tract (sinus) under the skin. Most commonly, these develop underneath the skin in the cleft between the buttocks where the buttocks separate (called the natal cleft). Some people call the condition “pilonidal disease”. Frequently, several interlinked holes develop, which all connect to the same sinus. A pilonidal sinus will not usually cause any noticeable symptoms unless it becomes infected. This can cause a pus-filled abscess to develop. Signs that you may have an infection include pain, redness and swelling in the affected area. Why do pilonidal sinuses develop? The exact cause of a pilonidal sinus is unclear, although it's thought to be caused by loose hair piercing the skin. Certain things can increase your chances of developing a pilonidal sinus, such as being obese, having a large amount of body hair (especially thick stiff body hair), and having a job that involves a lot of sitting or driving. The condition is more common if there is repeated trauma to area, especially in the presence of poor hygiene. It was very common in the second world area, especially amongst drivers of jeep. It was thought that bouncing on hard metal seats when with driving on poor roads and over potholes contributed to the development of the condition which became known as “Jeep seat disease”. The disease is between 2 and 4 times more common in men compared to women. Sinuses develop more frequently between puberty and age 40 (average age to present with a pilonidal sinus 21 years in men and 19 in women). Body shape may be important and having a deep cleft between the buttocks may be important. Having a family history of the condition may also be important – more than one-third of people have a family member with the condition. Many people with a pilonidal sinus have no symptoms at all and only have a small dimple or opening or pit in the skin of the natal cleft. If you have a pilonidal sinus, it's important to keep the area clean and dry. It may also help to remove any hair near the sinus. These steps can reduce the risk of infection. If symptoms develop, they can vary from developing discomfort to developing a large painful mass (abscess). The sinus may drain fluid that may be clear, cloudy or bloody. With infection, the area becomes red, tender, and the drainage (pus) will have a foul smell. The infection may also cause fever, malaise, or nausea. If a pilonidal sinus becomes infected, it should be treated sooner rather than later as it's likely to get worse without treatment. Treatment usually involves taking antibiotics and having the pus drained from the abscess during a minor operation called incision and drainage. There are several common patterns of this disease. Many patients who develop symptoms present with the sudden development of an acute abscess (the area is swollen, tender, and may drain pus). After the abscess resolves, either by itself or with medical assistance (e.g. an operation to drain the abscess), many patients develop a chronic discharge form the opening i.e. a discharging pilonidal sinus. The sinus is a cavity below the skin surface that connects to the surface with one or more small openings or tracts. Although a few of these sinus tracts may resolve without therapy, most patients need a small operation to eliminate them. What are the surgical options to treat a pilonidal sinus? The treatment depends on the disease pattern. An acute abscess is managed with an incision and drained to release the pus, and reduce the inflammation and pain. This procedure can often be performed under local anaesthetic. A chronic sinus usually will need to be excised or surgically opened. Complex or recurrent disease is unlikely to resolve without surgery, although any decision to operate will also depend upon the severity of the ongoing symptoms. Procedures vary from excision and leaving the wound open to heal with regular dressing. On occasion, it is possible to close the wound directly. Complex, recurrent or very large first time sinuses may require closure using flaps of skin form the buttocks (e.g. Karydakis Flap operation). Larger operations require longer healing times. If the wound is left open, it will require dressing or packing to keep it clean. Closure with flaps is a bigger operation that has a higher chance of infection; however, it may be required in some patients. Your surgeon will discuss these options with you and help you select the appropriate operation. What happens after my pilonidal sinus operation? Can I be treated for a pilonidal sinus ani at the Glasgow Colorectal Centre? Yes. Glasgow Colorectal Centre surgeons Richard Molloy and Graham MacKay are both experienced in the assessment and management of patients with pilonidal sinus disease. They will be able to perform an assessment and will also be able to recommend the most suitable operation, be that drainage of an abscess, to excision or the use of a flap such as the Karydakis Flap operation. If you have any questions about pilonidal sinus disease or other colorectal issues, your own GP is often the best first port of call. 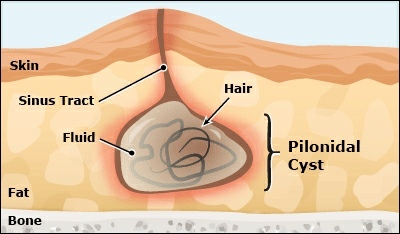 A pilonidal sinus is the tract or small tunnel which contains hairs. Most commonly these occur underneath the skin between the buttocks (the natal cleft). They may become infected and can give rise to an abscess or discharge from the area. Many can be managed conservatively by keeping the area clear of hair etc, although surgery may be necessary either to drain an acute abscess or because of chronic symptoms. What is pilonidal sinus?Why does pruritus ani develop?Why do pilonidal sinuses develop? What are the symptoms of pilonidal disease?What are the surgical options to treat a pilonidal sinus?What happens after my pilonidal sinus operation?Can I be treated for a pilonidal sinus ani at the Glasgow Colorectal Centre?